Tam MacPhail is well-known from his time running Stromness Books & Prints, from the mid-70s till his recent retirement. Even regular customers may not know that Tam had a significant career as an artist in the 60s and early 70s. 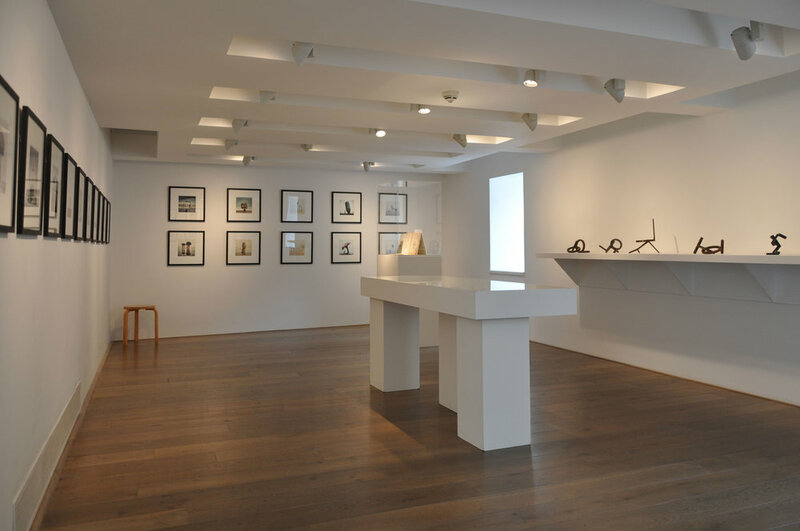 He exhibited with leading names such as Wilhelmina Barns-Graham, Fred Bushe and Jake Harvey, he received Scottish Arts Council funding; he exhibited in the Richard Demarco Gallery, and had work acquired by Kettle’s Yard in Cambridge. This biographical history is recorded in the fascinating archive display that is part of Tam’s half of the exhibition: posters for group shows, including a gloriously psychedelic one from 1972, invitations to openings, catalogues, pages from sketch books, reviews from The Guardian and The Scotsman, photographs of installations. It’s glimpses of the works in the photos that are most intriguing. In one, a metal windmill stands on a rocky shore in Argyll. A pointed scribe is driven by wind power to scrape round and round into the rock beneath it, over months or years of ‘drawing,’ cutting a circle into the adamantine surface. Other photos show the same piece of shore, long after the removal of the windmill. The perfect circle cut into the rock survives, mysteriously positioned between the man-made and the natural. As a metaphor for the persistence of art, it’s exemplary. Other photos show Tam’s fascination with apparently simple geometric forms – crosses, lines, more circles – in everyday materials like unfinished wood and iron. Their deceptive simplicity belies a concentration of thought that has gone into each one, and a wealth of suggestion that emanates from them. 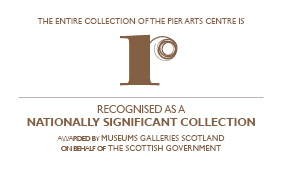 The same can be said about the five sculptures present ‘in person’ at the Pier. All are made from forged iron, all are less than a foot across, and all are composed of the same restricted vocabulary of circles and straight lines. But through clever variation of arrangement, abetted by the permission for the viewer to turn around and reposition the objects on their shelf, they demonstrate endless possibilities for interpretation. In 1975, Tam was awarded a £500 grant by the Scottish Arts Council, and a year later required to contribute to exhibit whatever that grant money had resulted in. Tam submitted every single cheque he had written over the previous period, adding up to £500. He had the cheques framed and hung in a block on the gallery wall, where they were offered for sale at the price of the original cheque. Nowadays we are used to artists appropriating and transforming their personal lives into art: Michael Landy’s Break Down springs to mind, which involved him destroying every object he owned; or Orkney’s own Harry Giles and his performance piece, Everything I Bought and How It Made Me Feel. But in douce 1970s Edinburgh, such a meta-comment on artistic creation was audacious and controversial. Paul MacPhail grew up in Stromness, but has lived for many years in Edinburgh. His attachment to shorelines remains strong. All the photographs in the exhibition were taken on Portobello beach, and are composed not just of sand and sea, but of a variety of objects both natural and manufactured that he finds there. Paul’s technique is to construct tiny, temporary sculptures from spoot shells, seagull feathers, pebbles, driftwood and varied human bruck. He photographs them in extreme close-up, framing them so they appear monumental. This effect is heightened in many of the photos by the presence of one or more human figures in the distance, which perspective tricks the viewer into seeing as walking past or standing beside the tiny/massive constructions. The description in words is sadly inadequate for the joyous and mind-bending experience of seeing these works. They play with scale, perspective and point of view in a way that is immediately accessible, but also profoundly thought provoking. For this viewer, teenage exposure to the dreamlike landscapes of Salvador Dali came to mind, but viewing them with some of Tam’s archive a few feet away suggests a progenitor closer to home. Writing in The Guardian in 1968, Cordelia Oliver said of Tam’s constructions, ‘their merit lies in their suggestion of a scale far greater than their own, so that you find it easy to imagine yourself, inch-high, climbing over them.’ And now, fifty years later, Paul is playing with our perceptions in a very similar way. I have no idea if Paul was familiar with that quotation and I also don’t know whether he is consciously building on the unique achievement in photography of his mother, Gunnie Moberg. But I do know that his work is an admirable complement to Tam’s. Together father and son give us show that is enjoyable, thought-provoking, and worthy of multiple viewings. The show runs at the Pier Arts Centre till September 8th 2018.